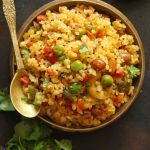 Dalia Upma is a savory broken wheat Indian breakfast loaded with fresh vegetables. Learn how to make broken wheat upma in a few simple steps. To make dalia upma heat oil in pressure cooker over medium heat. Once the oil is hot enough add mustard seeds, jeera and wait till seeds start crackling. Then add peanuts, cashews and fry for 2 - 3 seconds. Add chopped onion and green chili. Saute over medium heat till onion turn light brown in color. Now add the vegetables and saute for 3 - 5 minutes. Add broken wheat to the sautéed vegetables. Season with salt, and spices. Stir to evenly combine the seasoning. Pour water into the pressure cooker, stir once and close the pressure cooker with the lid. Put the pressure cooker weight on and after two whistles on medium heat turn off the gas stove. Let the steam of pressure cooker release on its own. Once steam is released remove the lid to open the pressure cooker. Gently, fluff the upma with a fork. Drizzle lemon juice and freshly chopped coriander. Gently mix. Serve Dalia Upma warm for breakfast with mint chutney. Add any vegetables of your choice or use vegetables that are in season like green peas, carrots, French beans, potatoes etc. If broken wheat is not pre-roasted, heat a teaspoon of ghee in the pressure cooker and roast it like sooji (rava) for 5 - 6 minutes or till aroma is released. Transfer to a plate and then proceed with the upma making process. Do not add too much water to cook the upma, it might turn mushy. Add just enough water to immerse the ingredients in the pressure cooker.